I'm quite thrilled today to not only pen my first proper book review here on the blog, but to also cross off my very first book completed for The Classics Club: Persuasion by Jane Austen. Persuasion is the third Austen novel I've read, the other two being Pride and Prejudice and Emma. Quite unlike my other previous encounters with Jane Austen novels, Persuasion represented a totally new experience for me because I knew absolutely nothing about the book before reading it. With Austen's more famous works, it's so easy to be aware of their basic plot lines through cultural osmosis (chances are if you haven't read Pride and Prejudice, for instance, you already have a pretty good sense of what it's about... and maybe a healthy admiration for Mr. Darcy). But, for me at least, that wasn't the case with Persuasion. It was a completely blank slate. I knew nothing of the characters or the plot--in fact, all I knew about the book was the title. That intrigued me and, since I like Austen quite a bit, I picked up the book with great interest. Here's what I discovered along the way. 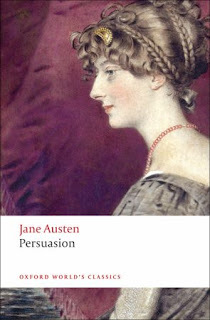 Austen's final finished work, Persuasion is the story of twenty-seven Anne Elliot, a baronet's daughter, who eight years before the novel opens is briefly engaged to dashing naval officer Frederick Wentworth. Under the influence of her pompous father Sir Walter (rendered in satirical perfection by Austen) and her well-meaning mentor Lady Russell, Anne was persuaded to end her engagement to Wentworth, deemed an inferior match for a woman of Anne's position. We meet Anne close to a decade after this fateful event, living a quiet, if by turns unhappy, life with her father and elder sister Elizabeth, who is Sir Walter's protege in manners and temperament. Rounding out the family is the youngest (married) sister Mary Musgrove, another brilliant Austen caricature of self-absorption. The ensuing years have not been kind to the gentle and self-effacing Anne. She has not found another suitor who can supplant the place that the long-departed Wentworth still holds in her heart, and she is regularly ignored and devalued by her family. Through several twists of fate, Anne and Wentworth are of course thrown into each other company's again. Much of the story, which unfolds gradually, centers on the tension between the former lovers and the nature of their meaning to each other now, many years later. In its look at Anne and Wentworth's romantic past, Persuasion is a meditation on lost chances, the nature of regret, and the consequences of external influence in matters of the heart. I ended up greatly enjoying Persuasion, although at first I was somewhat taken aback by how different it was than what I had initially envisioned. From my prior reading, I had a certain idea of what a Jane Austen novel entailed, and Persuasion doesn't necessarily fit that mode, although it comes with a very Austen-esque set of supporting characters (read: people just made to be satirized) and plot twists that are much in line with what you've come to expect and love if you're an Austen fan. That being said, it's a more introspective and somber book, with a more mature heroine. In many ways, I felt that Persuasion, in its construction and tone, is much like its heroine: a book that sneaks up on you and ultimately enchants you. There was just something about the novel that kept me coming back, even in the early chapters when I wasn't fully sold. I think that speaks in many ways to Austen's brilliance as an author, in the way that the novel's construction and Anne's situation within it, work so harmoniously together to weave the novel's themes of reflection, regret, and, ultimately, second chances. Lastly, I would be completely remiss if I did not mention what a compelling romance Anne and Wentworth share. For those of you who haven't yet read Persuasion, it's worth reading for that alone, especially one truly breathtaking episode that made me tear up... and then re-read like five times in a row (pretty sure those who've read it know exactly what I'm talking about here). ...Anne, with an elegance of mind and a sweetness of character, which must have placed her high with any people of real understanding, was nobody with either her father or sister: her word had no weight; her convenience was always to give way;--she was only Anne. I love this quote, because it so eloquently sums up Anne's general character and its distinction from that of her family. She had the advantage of him, in the preparation of the last few moments. All the over-powering, blinding, bewildering, first effects of strong surprise were over with her. Still, however, she had enough to feel! It was agitation, pain, pleasure, a something between delight and misery. This quote is the perfect embodiment of that anticipatory feeling that accompanies uncertain love. Who hasn't felt this way at some point in it? Overall, I really enjoyed this book and give it 4 stars out of 5. It loses one star mainly because the plot remains somewhat plodding throughout much of the novel, although it picks up significantly in the final quarter or so. A few moments also felt contrived to me, especially Anne's all-too-convenient-plot-driven conversation with Captain Harville. But all in all I found Persuasion to be a marvelous read and an interesting--and ultimately rewarding--departure from some of Austen's earlier works. It's definitely not the best book to start with if you're new to Austen, but it's a nice book to tackle if you enjoy her writing and have a few books of hers under your belt. Some further discussion later this week about Persuasion. Stay tuned! Oscar Wilde's An Ideal Husband- I've never read anything by him, so I'm looking forward to this one. I'm reading it for the Victorian Celebration. I think Persuasion is my least read Austen (other than Mansfield Park, because *snore*) but actually it's kind of one of my favourites... Maybe just for the letter, but ohmygosh The Letter! Such beautiful writing that makes my heart happy! Thanks for inspiring me to read this again soon! Oh cool, glad to hear it! And, yeah, The Letter is just so amazing...and so unexpected the first time you read the book too. Everything up until that has is all small glances and little moments between Anne and Wentworth--and then BAM! here comes The Letter. Sigh. I think it's pretty hard not to cry and re-read at that part. ;) Such an enjoyable read! I'm looking forward to reading Jane Austen. I've not read any of her works, and have them all on my list. Oh that's great! Looking forward to hearing what you think and which books you like the most. I've read Persuasion a couple of times, and I love the way you've described the book. You seem to have hit the nail on the head! There's something rather elusive about the novel that leaves you with a certain sort of lingering feeling. To be honest, unlike the other Austens I've read, this one has a rather forgettable plot...at least where I'm concerned...but the characters leave a lasting impression. They're more mature and wholesome, and very very real! You're so right about the novel's elusive quality--that's a really great way to describe it. It's rather hard to put into words what's so special about the book, I find... it just has a certain *something* that makes it memorable. I like your insights about the characters too- they definitely feel real and fully formed! I love your review! Anne is my favorite Austen heroine. I admire her luminous character, superior in every way to all the other characters in the novel. Despite many disappointments, she does not dwell on misfortune or become bitter, and ultimately, her forbearance is rewarded. Perfection! I read Persuasion in preparation for a literary-themed trip to England in January. I visited Bath and the Jane Austen Centre (http://www.janeausten.co.uk/). At the Austen Centre they spoke of this being her last completed novel. Her illness during that period and the downward spiral in her family’s fortunes affected her outlook, and account for the more critical look at Bath society (compared to Northanger Abbey, written early in her career, but also published posthumously). It was fun to walk around and imagine Miss Elliott on Captain Wentworth’s arm, strolling the same streets! I love this one. The plot can feel plodding at times, but it's the love story that stood the test of time. Completely agree, Arie. Plodding plot + bewitching love story = Persuasion in a nutshell!